Many thousands of miles above our planet’s surface, electrons whiz through close to the speed of light. These electrons can streak past Earth in under five minutes, but can also become dangerous and have been known to destroy satellites and even injure astronauts in extreme cases. 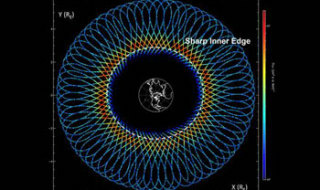 Most of the time, however, our gear and astronauts can rest safe since scientists have discovered what’s called a invisible shield or barrier lying within the rims of the Van Allen Radiation Belts that’s impenetrable to the relativistic electrons. So, despite their intense energies, the electrons can’t come close than 11,000 km from the Earth’s surface. 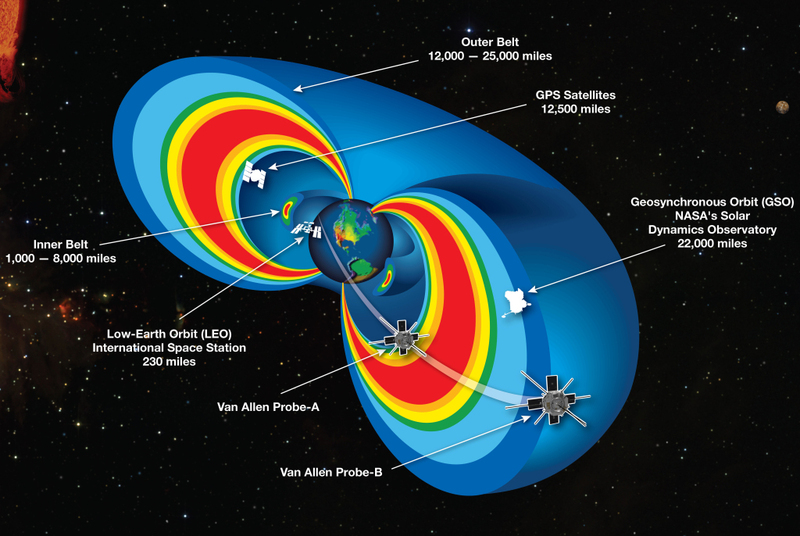 The discovery was made based on data collected by NASA’s Van Allen Probes—twin crafts that are orbiting within the harsh environments of the Van Allen radiation belts. 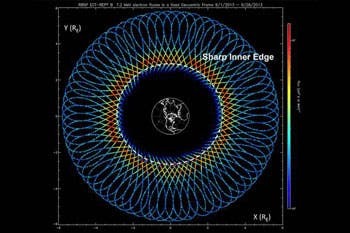 These belts can be seen as one big torus of energetic charged particles around Earth, trapped by Earth’s magnetic field. These extend from circa 650km (inner ring) to 65,000 km (outer ring) above the Earth. The existence of two belts, sometimes considered as a single belt of varying intensity, was confirmed from information secured by launching the first U.S. earth satellite, Explorer I, sent up during the International Geophysical Year of 1957–58. The belts were named for James A. Van Allen, the American astrophysicist who first predicted the belts and then was first to interpret the findings of the Explorer satellite. Data collected over 20 months suggested there’s a “exceedingly sharp” barrier against ultra-relativistic electrons also called “killer electrons” because of their havoc wrecking potential. Oddly enough, this barrier helds steady even during times of exceeding blasts of electrons, moved forward by solar storms. Left scratching their heads, MIT researchers tried to figure out what was keeping this shield up and considered several possibilities, including effects from the Earth’s magnetic field and transmissions from ground-based radios. First, the researchers looked the South Atlantic Anomaly – a patch in Earth’s magnetic field, just over South America, where the magnetic field strength is about 30% weaker than in any other region. The reasoning was that if Earth’s magnetic field was indeed responsible for the shield, then incoming electrons should fall deeper into the Earth’s atmosphere and sink into the ‘hole’. There was no such thing and the killer electrons stayed put at 11,000 km above the planet’s surface. Long-range, very-low-frequency (VLF) radio transmissions can leak into the upper atmosphere, but upon closer inspection researchers found that these could only deflect moderate energy levels, posing little shielding against the energy intensive relativistic electrons. Luckily, the twin probes were equipped with instruments that could measure electrons’ pitch angle—the degree to which an electron’s motion is parallel or perpendicular to the Earth’s magnetic field. 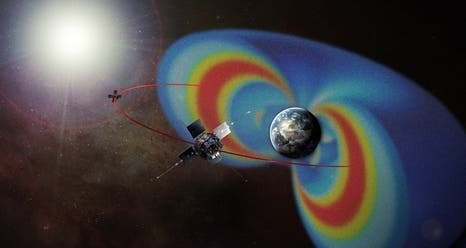 The measurements revealed that the electrons slowly rotate their paths causing them to fall, parallel to a magnetic field line, into Earth’s upper atmosphere, where they are likely to collide with neutral atoms and disappear. 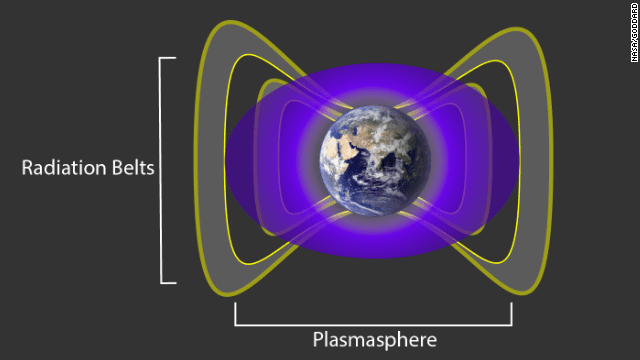 It was later found that a peculiar phenomenon called “plasmaspheric hiss” – very low-frequency electromagnetic waves in the Earth’s upper atmosphere that, when played through a speaker, resemble static, or white noise – was the actual culprit. The hiss waves are believed to travel through a cloud of electrically charged gas that is known to surround Earth, starting at an altitude of 600 miles. This cloud, known as the plasmasphere, interacts with the high-energy electrons, scattering from their paths. It’s amazing how safe guarded our planet is. We have an atmosphere, a magnetic field, the radiation belts, the plasmasphere and who knows what else. If anyone had any doubt how precious and special this planet is, look no further. Findings appeared in the journal Nature.